The 1,2-hydride shifts can occur during the reactions if an unstable carbocations is formed next to a tertiary carbon. We have already talked about rearrangement in Rearrangement [H shift] of alkenes. Let’s look at what kind of rearrangements happen with carbocations of alkyl halides during SN1 reactions. Stability of carbocations: tertiary > secondary > primary. In every reaction, any carbocation will take more stable form. Thus, if we have primary or secondary carbocation they undergo rearrangement to achieve a more stable form (tertiary carbocation or more stable secondary). In the following example, we have alkyl halide which has a poor leaving group and the first step will be protonation how we will get a better-leaving group. 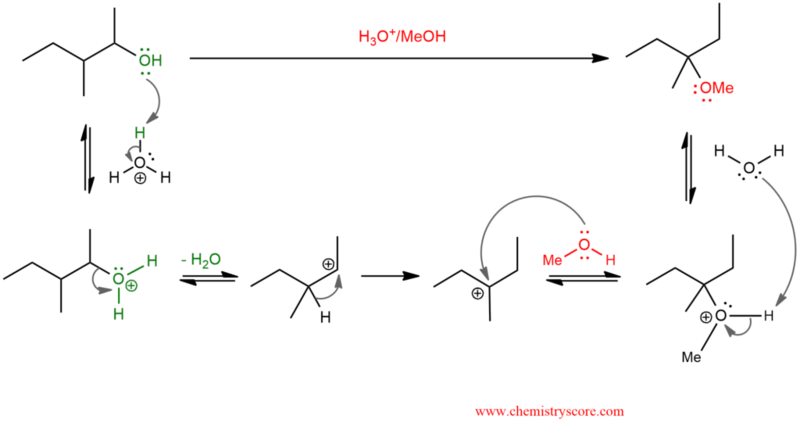 This means that this mechanism consists of five steps: proton transfer (protonation), loss of the leaving group, carbocation rearrangement, nucleophilic attack and proton transfer (deprotonation).